Solar PV Layout and Solar design software tool. PV Layout Tool allows one to design PV panel layouts from aerial imagery, remotely from a browser. Define buildings, installation areas, keep out areas (such as skylights or chimneys) and obstacles (such as trees). 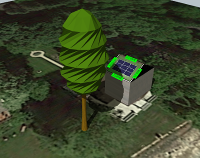 The Tool will auto place solar PV modules, create sun path and shade views, generate 3D views, export images, and more! Includes a "showcase" view that allows you to rotate and zoom the solar design and PV layout with your customer. Just one of the many industry-leading features included in ONtility ProTM - helping you focus on what really counts: identifying your customers` needs, designing smart solutions, and getting new business on the books. The PV Layout Tool is included at no additional cost. The PV Layout Tool is part of the ONtility ProTM online application and is used for designing and analyzing a specific site and evaluating the number of solar PV panels that can be fit into site areas. Design the layout of photovoltaic (PV) systems based on numerous factors to reflect the characteristics of landscape specific to the area including site location, time zone, sun path, solar panel spacing, PV array edge offsets, tilt and azimuth angles, and nearby objects such as trees and buildings that may obstruct or cast shadows over the solar panels. Assess Solar Shade: Visualize the effects of nearby objects such as chimneys, trees, buildings and adjacent PV panels that could reduce the efficiency of the solar panel layout design. 3D Visualization to view PV array(s) in three dimensions (3D) and provide a "showcase" view that allows you to rotate and zoom the solar design and PV layout with your customer.